Impressive graphics, dual humbuckers and comfortable to play. 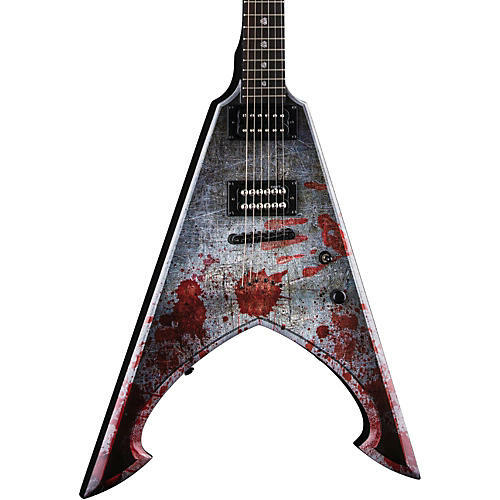 Dean's Michael Amott Signature Tyrant is an affordable guitar that makes no apology with a lightweight mahogany body, set neck, and 22-fret rosewood fingerboard. The short 24-3/4" scale and "V" shape make this an extremely easy guitar to navigate with access up the entire fretboard. DMT Design pickups give you a wide range of great tones to work with – from sweet vintage to modern aggressive. Grover tuning machines, and fixed Tune-o-matic bridge offer stability and added sustain. Case sold separately.